This Flagship Program addresses challenging related to the growing need to better understand food safety solutions that can work in informal or formalizing markets. There is an urgent need for technical and institutional solutions to food safety challenges, and broader policy and regulatory approaches to manage food safety risks in dynamic, developing markets. This flagship conducts targeted research on technological and institutional solutions and appropriate policy and regulatory options that align public health goals with country priorities to ensure that food is both safe and equitable for the poor. This flagship focuses primarily on mitigating aflatoxin contamination in key staples and on managing risks in informal markets for nutrient-rich perishables like meat, milk, fish, and vegetables. Below is a visual depicting the Flagship 3 impact pathway. CoA1: Evidence that Counts generates evidence on questions at the interface of agriculture and foodborne diseases so that key food safety evidence users (donors, academics, INGOs, national policymakers, civil society, and industry) are aware of and use evidence in the support, formulation and/or implementation of pro-poor and risk-based food safety approaches. 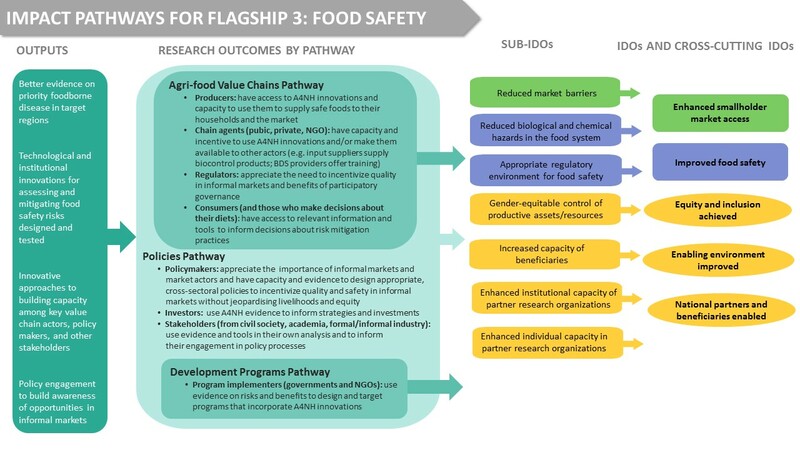 CoA2: Safe Fresh Foods conducts research on how an institutional innovation known as training & certification (T&C) can improve the quality and safety of fresh foods (initially limited to dairy and meat), in order that market-based food safety innovations, like T&C, are delivered at scale in key countries along with understanding of their impact and appropriate use. CoA3: Aflatoxin Mitigation looks at how use of farm-level mitigation technologies and practices, like good agricultural practices, resistant varieties, and/or biocontrol (aflasafe™), could reduce aflatoxin exposure among consumers with the goal of seeing biocontrol and good agricultural practices delivered at scale in key countries along with understanding of their impact and appropriate use. 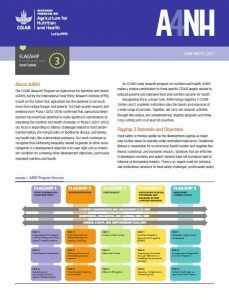 Read more about Flagship 3 and A4NH's work on Food Safety, as well as other news and updates on this topic.